Hello everyone! 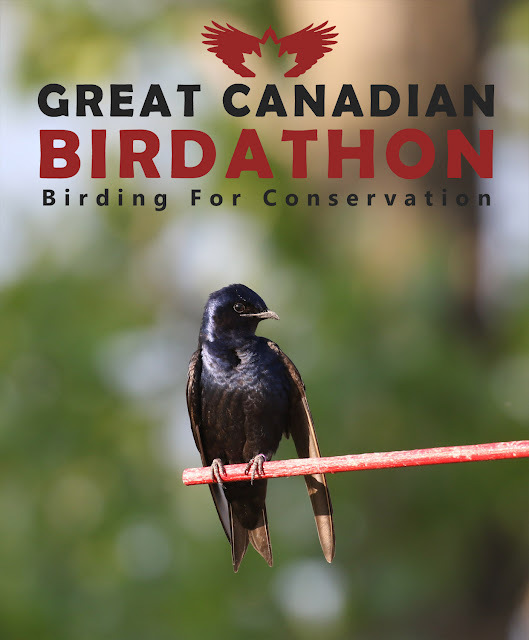 I will once again be participating in the Great Canadian Birdathon, a fundraiser to raise money for bird conservation and research. If you would like to support bird conservation you can donate to my page HERE, and click 'give now' to help reach my fundraising goal. Thank you for your generosity, any donations are very appreciated! Click on the photo to go to my birdathon page! This is my third year participating in the Great Canadian Birdathon. to read about my previous birdathon experiences you can go here and here. This year I will be directing the funds I raise to the Delta Marsh Bird Observatory. Participants of the birdathon will go birding in a 24 hour period in May to see as many species of birds as they can. Last year I saw a total of 127 species of birds. Thank you once again for your consideration and support for this cause. Although the ground is covered with snow now, here are some more photos from a few days ago when it wasn't. Last Thursday we went to Oak Hammock Marsh again (third day in a row). We didn't see anything particularly exciting or different from the previous days, besides some skunks. This muskrat on the trail looked like it had a piece of it's fur ripped off. The splendid evening sunset made for beautiful lighting for photos. We walked right by a skunk when we we walking on the trails, it was peering warily at us from the reeds. We encountered another one on the side of the road when we were driving. It swam through a ditch, and my brother William got some photos of it as it ran off into the sunset. Last Saturday my brother Matthew, a friend and I biked 60km to Patricia Beach on Lake Winnipeg. Although we didn't see as many birds as I was hoping (in fact we saw very few birds), I did see my first of the year Turkey Vulture and Tree Swallow and was able to get some pictures of a Bald Eagle as it sat in a tree beside the beach. Today is snowy and chilly. I went for a short walk before it really started snowing and the most notable birds I saw were Eastern Phoebe and Golden-crowned Kinglets, both common around here. At the feeders are many juncos, a few Fox Sparrows, a decent amount of Purple Finches, and I saw my first of the year Chipping Sparrow beneath the feeders today. That's all for now, happy birding! Here are some more photos from yesterday of some spring birds. Yellow-rumped Warblers are now common yard birds, and we often see them coming to our suet feeders right out our window, which is a lovely treat. When my brother was in music lessons I had the opportunity to bike to a nearby park, Bois-des-Esprits, to see if there were any birds around. As I was cycling I heard a Merlin, and saw a Northern Flicker (first of the year) and a Hermit Thrust (first of the year). When at the park I cycled around the bike trails, got a little lost and got my bike a little muddy. There were some great birds though, such as a Cooper's Hawk which kept calling and flying around, Golden and Ruby-crowned Kinglets, Hermit Thrushes and Northern Flickers. Yesterday evening we returned to Oak Hammock Marsh to try and see the Eurasian Wigeon again. When we got there the flooded field the it and many other ducks were in was mostly empty. We weren't able to find it, but at least two others saw the Wigeon yesterday. After we were unable to find the Eurasian Wigeon we went for a short walk at the marsh. There were also a few Short-eared Owls flying around near the parking lot. Because it was already dusk we couldn't get good photos. Yesterday we went to Oak Hammock Marsh for a friends birthday. Before we left to the marsh we walked around our yard and saw some Eastern Phoebes and Yellow-rumped Warblers. The spring birds have been coming in, with first of the years day by day. We headed out to Oak Hammock Marsh, but several kilometers before the turnoff to the marsh we stopped at a field full of waterfowl. There were a lot of Northern Pintails, Mallards, as well as a few Green-winged teals. We spent ten or fifteen minutes scanning the flock of ducks. My brother spotted a different looking duck with a orange head. The bird was perhaps 500 m away. At the time we weren't sure what it was, but we later identified it from the photo as a Eurasian Wigeon. Eurasian Wigeons are accidental here, only being seen once in a while. eBird says the last time one of them were spotted around this area was about ten years ago. After enlarging the photo you can clearly see the rufous head and buffy forehead. Unfortunately due to the distance I did not get any better photos, but enough to make it out clearly. As soon as we pulled into the Oak Hammock Marsh parking lot we spotted a Great Egret in a pond. Seeing it brought back memories of Florida a year and a half ago, where we saw hundreds of egrets. We then walked around the trails of Oak Hammock Marsh, about 3.5 km. There were many of the common marsh birds, and many species of waterfowl have returned. It is a bit too early for shorebirds, except for Killdeer. There was also several Yellow-headed Blackbirds, which is a bit earlier than usual. And of course many ground squirrel running around. There were also some waterfowl out on the water, but too far for decent photos. There were Red-necked Grebes, Buffleheads, American Coots, Ring-necked Ducks and Horned Grebe. Since yesterday when we discovered the Eurasian Wigeon, I believe it has been seen two times. We returned again today in search of it but to no avail. However we did see some Short-eared Owls flying around the marsh which was a special treat. Stay tuned for more posts as more Spring birds come around! Hi there! This is my blog for documenting my birding experiences and photography, in my backyard, or in my travels. Giveaway Winner – Best Places to Bird in the Prairies!